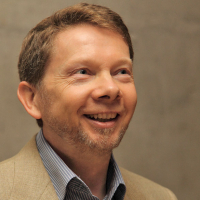 Eckhart Tolle is a German-born resident of Canada best known as the author of The Power of Now and A New Earth: Awakening to your Life's Purpose. In 2008, a New York Times writer called Tolle "the most popular spiritual author in the United States". In 2011, he was listed by Watkins Review as the most spiritually influential person in the world. Tolle is not identified with any particular religion, but he has been influenced by a wide range of spiritual works.He began writing his first book, The Power of Now, in 1997 and it reached The New York Times Best Seller list in 2000.